We write to urge the Landmarks Preservation Commission to withdraw the proposed Rules Amendments heard at the public hearing on March 27, 2018, about which we have a variety of very serious concerns, for some of us fundamental. Historic homes on Jones Street in Manhattan. Photo: Wikimedia Commons, Pubdog. The functioning of the Landmarks Preservation Commission affects many constituencies. 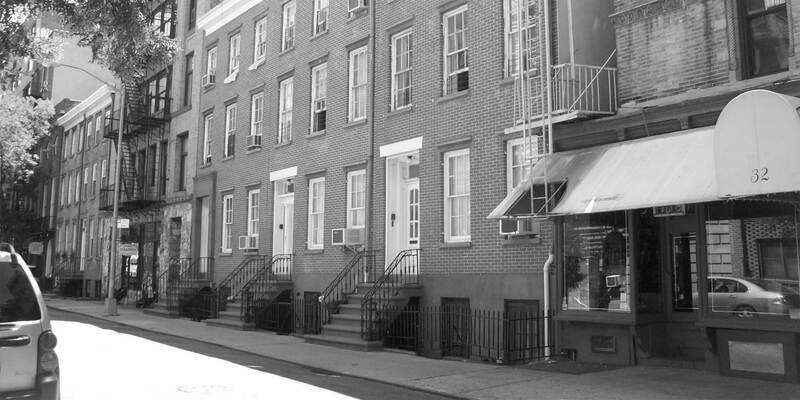 As the LPC is the principal overseer of over 36,000 properties throughout New York City and typically responds to over 13,000 permit applications affecting these properties annually, exactly how the agency makes its decisions is of great concern to neighborhood residents, property owners, community boards, building professionals, local groups, preservation organizations, and elected officials. Indeed, all New Yorkers who care about our city’s shared physical heritage have a stake in how that irreplaceable resource is managed. The Rules of the Landmarks Preservation Commission must serve a number of goals. They must establish a baseline standard of appropriateness which emphasizes best practices (as developed by the professional preservation community) for the preservation and restoration of historic buildings. The Rules must provide clear, easily understood parameters for the appropriate redevelopment of designated landmark properties, such that stakeholders in the preservation of New York’s recognized historic buildings (applicants and the public alike) can have a reasonable sense of what may and may not be permitted. Finally, the Rules must allow truly appropriate work to be performed on landmark buildings in order to permit the agency to efficiently function. These goals are stated as part of the preamble of the currently proposed amendments to the Rules. Unfortunately, as currently brought forward, the Landmarks Preservation Commission’s proposal falls short of these objectives and risks pushing the Commission away from both its mission and its long history of engaging the public. The overall diminution of public review of projects – estimated in the LPC’s presentation to be up to 20% of proposals which are currently brought to public hearing. Procedural incentives for the use of substitute and faux materials in restorative work. A broader allowance of more visible and larger additions to buildings. The new characterization of landmark properties which are deemed to be “not…building(s) for which the district was designated” “and other administrative terminology with no basis in the Landmarks Law. A decision to organize the new rules by “work-types” without adequate consideration of the impact of standardization on the unique character of our diverse historic districts and individual landmarks. Any one of these concerns should be enough to cause this proposal to be re-examined. All five of them, echoed by design professionals, community groups, concerned neighbors and preservation experts speaks to fundamental flaws in the proposal. The cumulative effects of these 112 pages of proposed changes on New York City’s designated landmarks are essentially unknowable, especially if the desired outcome is achieved and more proposals become Balkanized between staff-level and Commissioner decisions. Rather than assurances, these changes to the Rules create more uncertainty for the public and bargain away the future of our landmark buildings to save time during the application process, Furthermore, putting more pressure on the staff in order to alleviate workload of the commissioners only compounds the agency’s perennially strained resources. We join with Manhattan Community Boards 3, 4, 5, 7, and 8, Brooklyn Community Board 8, Queens Community Boards 3 and 10, City Council Speaker Corey Johnson, City Council Land Use Chair Rafael Salamanca, City Council Landmarks Subcommittee Chair Adrienne Adams, Council Members Ben Kallos, Keith Powers and Carlina Rivera, Manhattan Borough President Gale Brewer, State Senators Brad Hoylman and Liz Krueger, Assembly Members Deborah Glick and Richard Gottfried, dozens of our preservation colleagues and the New York State Historic Preservation Officer in raising serious concerns about this proposal. There are layers of questions which have been raised and interlocking concerns which must be answered. We therefore urge the Landmarks Preservation Commission to withdraw this application.